Israeli forces raided the village of Ni’lin, west of Ramallah, on Thursday morning, storming houses and detaining dozens of young men. 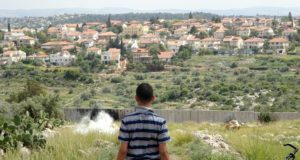 The mayor of Ni’lin, Aiman Nafe’, accused the Israeli forces of trying to prevent a sit-in protest planned for Thursday by Ni’lin farmers and their families on the village lands that will be confiscated by the separation wall. 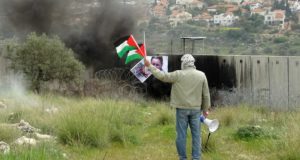 Media spokesman of the Popular Campaign for Resisting the Wall, Salah Al-Khawaja, said that dozens of Israeli military vehicles carrying soldiers and officers stormed the village early on Thursday morning. Israeli forces imposed a curfew, preventing the residents from going to work or reaching the place in the centre of the village designated for the sit-in, in an attempt to deter Ni’lin residents from continuing their peaceful struggle against the wall. Salah Al-Khawaja affirmed that these Israeli attempts would not thwart Ni’lin residents, farmers and the popular campaign from continuing their nonviolent resistance programme which has proved its effectiveness recently. 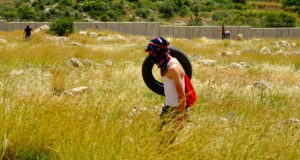 Villagers have managed to prevent the bulldozers from demolishing lands and building the wall on various occasions through their peaceful protests, as well as exposing the Israeli army’s violent practices in repressing peaceful demonstrations and popular initiatives rejecting Israeli settlement expansion, wall construction, and land expropriation in the village.